Using his own collaboration with Frank Wells at Disney as a launching point, Michael Eisner offers us an intimate look at 10 of the most rewarding business partnerships, including Bill and Melinda Gates, Warren Buffet and Charlie Munger, and Joe Torre and Michael Gordon. Learn what makes great partnerships succeed in this essential book for executives everywhere. When compared with the many other virtues of an effective leader, the ability to cultivate, nourish and grow strong and effective partnerships helps the cream of the crop rise to the top of business and life. That’s why Microsoft's Bill Gates said, "I’ve never done anything solo — except take tests." Few top business executives have the level of name recognition as former ABC, Paramount and Disney executive Michael Eisner. That’s because he spent 40 years in the American entertainment industry turning out hits and helping companies increase their profits. While at ABC, Eisner took the network from No. 3 to No. 1. At Paramount Pictures, he helped make breakthroughs like Raiders of the Lost Ark and Saturday Night Fever. At Disney, he grew the company from a $1.8 billion film and theme park company to an $80 billion global media powerhouse. 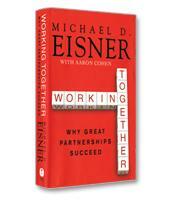 In Working Together: Why Great Partnerships Succeed, Eisner describes, in detail, the business partnerships that made him successful at Disney along with nine other partnerships from a variety of top organizations that made those organizations stronger. These include the partnership between Bill and Melinda Gates at The Gates Foundation, Joe Torre's relationship with Don Zimmer while they worked for the New York Yankees, and director and actor Ron Howard's hit-producing partnership with producer Brian Glazer. 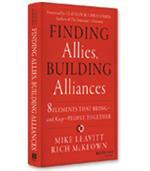 While recounting the intricacies and effects of these and other important business relationships, Eisner explains how great partnerships build great organizations. Eisner's personal story of partnership success is one of the most intriguing tales recounted in Working Together. Eisner writes that his 10 years of collaboration with Frank Wells at Disney were the most successful years of his career. He also recounts how the mutual support between the two men ended in 1994 when Wells died in a helicopter crash. Eisner writes that he and Wells shared "comfort, camaraderie and connection, family friendship and intellectual fellowship." Beyond stories from his own winning business collaboration with Wells, another partnership Eisner highlights is between Warren Buffett, the most successful investor in the world, and his business partner Charlie Munger. One of the keys to the success of that partnership, Eisner points out, is how the two powerful men are different yet still think alike. For example, although Munger admits that Buffett works harder that he does, both men say that their organization succeeds because they both enjoy doing the work that they share. Munger explains, "It's much more fun, two than one. ... Total isolation does not work. You need interaction, putting your own thoughts into expression; you learn things just from doing it." In Working Together, Eisner and his writing partner Aaron Cohen — a writer and television producer with 13 Emmy Awards — offer readers many important and useful tips for growing world-class partnerships that last.